Notre Dame sophomore catcher Claire Dettwiller prepares to receive a pitch from Isabel Cassidy in the Titans win over Eastern Friday night. To cap off a great start to SOC II play, the Wheelersburg Pirates (3-1, 2-0 SOC II) defeated the Northwest Mohawks (1-4, 0-2 SOC II) 9-1. Wheelersburg travels to western Ohio Saturday to face Fort Laramie, hoping to improve their record to 4-1. Northwest will face South Webster on Monday with a chance to pick up their first win of 2019. Portsmouth West (3-0, 2-0 SOC II) defeated South Webster (0-6, 0-2 SOC II) in their home conference opener Friday evening, 11-5. Four different Senators combined for eight RBI in Friday night’s win, each finishing with two apiece. Those four are Trevor Staggs, Luke Bradford, Luke Howard, and Austin Arnett. On the mound, senior Dylan Bradford picked up the win, going 3.0 IP while giving up four hits and just one earned run. Senior Garrett Hurd also went 3.0 IP while allowing just one hit and no earned runs. For the game, West gave up just one earned run in seven innings. Jacob Ruth had the best scoring day for the Jeeps in defeat, going 1/2 with two walks as well as scoring two runs in their road loss. West will have a two game series with Wheelersburg next week on Monday and Wednesday, while South Webster will prepare to face Northwest for a two game series next week. The Valley Indians (2-3, 0-2 SOC II) fell to the Waverly Tigers in their home conference opener Friday evening. Jesse Jones led the Indians at the plate in their loss to Waverly by going 2/4 with 2 RBI. Devin Wiley is credited with the loss in Friday evening’s game after going 4 IP giving up six hits and three earned runs. Valley is back in action on Monday when they begin their season series with SOC II rival Minford. The Clay Panthers (4-1, 2-0 SOC I) had a monster day at the plate in their 22-2 win over SOC I foe Western. Three different Panthers led the way with a game high 3 RBI in their blowout of the Indians, those three being Clay Cottle, Jaden Jesse, and Garrett Beegan. Clay’s Reece Whitley also finished 4/5 at the plate to go along with 2 RBI. On the mound, four different pitchers saw time for Clay: Shaden Malone, Carson Portginski, Clay Cottle and Caleb McNutt. They combined for just two earned runs and three hits in their five innings played. Clay prepares for their contest with Portsmouth on Saturday to try and improve to 5-1. Eastern defeated Notre Dame (0-4, 0-2) in their home conference opener Friday evening, 5-1. The Titans will face Symmes Valley next week in attempt to pick up their first win of 2019. The Pirates (4-1) earned their second win in three games over a West Virginia program this past week with a rout of University, Friday evening. Offensively, Bella Williams was 2-for-2 with a double, a run and two RBIs while Rylie Hughes finished 2-for-2 with a double, two runs and two RBIs. Mallory Bergan was also a factor, going 1-for-2 with a double, a run and two RBIs. In the circle, Sarah Claxon threw three innings, allowed two hits and struck out three en route to the win. The Bobcats (2-2, 2-0 SOC I) got their second win this season, coming in a nine-run victory over New Boston (1-2, 0-2 SOC), Friday. Green was led by Rachael Cline, who finished 2-for-5 with a home run, a double, two runs and four RBIs while Kerston Sparks was 2-for-5 with a double, a run and three RBIs. Ava Jenkins also had a good night, finishing 3-for-4 with two runs and three RBIs. For the Tigers, Brooklyn Hoskins was 2-for-4 with an RBI and Shelby Easter was 2-for-3 with an RBI. After Friday’s 16-0 rout of Western, the Panthers (3-0, 2-0 SOC I) have started their season outscoring opponents 34-0. Clay was led by Hannah Oliver in the circle, who threw a perfect game in five innings of work, striking out 12. She was also 2-for-2 with a double and two RBIs at the plate. Jensen Warnock helped out, going 2-for-3 with a home run, three runs and two RBIs, and Cassidy Wells was 1-for-1 with a double, two runs and three RBIs. The Tigers (3-0, 2-0 SOC II) stayed hot at the dish Friday evening, collecting 10 hits in route to an 11-run win over Valley (0-3, 0-2 SOC II). 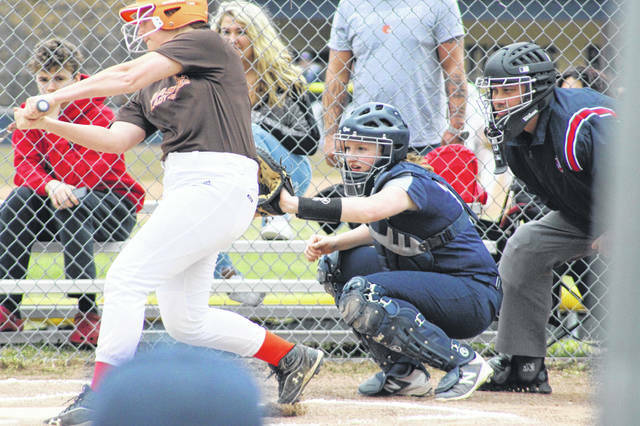 Leading Waverly to the victory was Kirsten Blair, who was 1-for-2 with a run and two RBIs, Emma Bellaw, who was 1-for-3 with a run and two RBIs, and Zoiee Smith, who was 2-for-4 with a triple and two runs. In the circle, Kirsten Blair picked up the victory, throwing three innings, allowing just two hits and striking out four. The Jeeps (4-3, 1-1 SOC II) got a win over the Senators (2-3, 1-1 SOC II) Friday evening. South Webster was paced by Emmy Bailey, who was 2-for-3 with a run and two RBIs, Rylee McGraw who was 2-for-5 with a triple and three runs, Mack Kelley who was 4-for-5 with two runs and an RBI, and Kaylea McCleese who was 2-for-5 with two runs and an RBI. Gwen Messer picked up the pitching win, throwing four innings, allowing three hits and striking out seven. Emily Sissel led West at the plate, going 2-for-3 with a triple, a run and an RBI. Abbie Pack was 2-for-4 with a run.